This veteran salesman’s advice can be taken to heart by anyone who’s sold almost anything for a living. 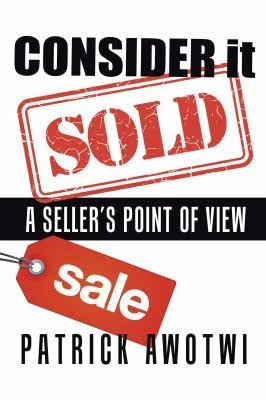 In Consider It Sold: A Seller’s Point of View, veteran sales executive Patrick Awotwi offers his insights and opinions on the sales profession—views shaped by his experiences rising through the ranks of sales departments at multinational beverage companies. Over the course of the book’s first seven chapters, the author touches on common ground for many sales professionals, including roadblocks that can crop up around product distribution, partnerships with the retailers that serve as middlemen between companies and consumers, and motivation of frontline staff. Sometimes the book’s insights seem limited by the specific sets of circumstance that Awotwi draws from, particularly his work in sub-Saharan Africa in the 1990s and early years of this century. Consider It Sold becomes as much a history lesson as it is an insight into sales challenges that professionals around the world face today. The content and context is also limited to the distribution and sale of physical consumer products—beer and soda—which might make the challenges explored somewhat different from those of sales counterparts selling business-to-business products, services, or items that simply don’t face the same physical distribution requirements as a case of lager or lemon-lime pop. The book’s grammar and punctuation are impeccable throughout, which also hints at a careful eye toward editing. Syntax sometimes suffers, though, especially when ideas are expressed through passive writing, lengthy sentences, and overly complex wording. The book’s message is clearest and most effective when it is illustrated by real-world anecdotes from the author’s career, which also make it evident that he has ample experience and valuable views to share with other sales professionals. As such, Consider It Sold‘s final chapter, where Awotwi offers advice to colleagues’ conundrums, is one of the most straightforward, effective, and universally applicable chapters for salespeople across a wide range of industries. Here, the author casts himself as an “agony uncle,” or newspaper advice columnist, who responds to people’s letters seeking guidance on personal issues. Awotwi says that these letters were penned by real protégés seeking his advice on professional problems. Consider It Sold offers an inside look at the challenges of being an effective sales professional and executive in the beverage industry. It also offers valuable anecdotes and insights for salespeople in other industries—advice that can be taken to heart by almost anyone who’s sold anything for a living.